That looks like a cinder block on your back. I take it you didn’t have a choice to stay home. You can probably see the glum expression a little better than we can. David, My favorite place would be California! I know it’s pretty general but the Sierra is where most of my backpacking is done but I really enjoy the Channel Islands and the Mojave Desert where you can drive until the road ends and hike for miles. I haven’t tried any desert backpacking trips longer then an over night because of the amount of water one has to carry and there aren’t many water sources you can depend on besides the Colorado River, everything else to the west of it is bone dry. Backpacker was an unknown magazine? And now each and everyone one of us is now one in 31 million, that is a lot of backpackers. I seem to lose an item every now and then when backpacking, it’s by accident but it is still littering. I should really pay more attention to properly securing items on my pack and stop using my loose pockets to put things in that will likely get lost. The wind is also a contributor to this unintentional littering. The funniest thing I often come across out there is broken mylar balloons. Hi Steve, my pack looks heavy for my size in that picture, doesn’t it? It probably was, but nothing compared to Mom or Dad’s. They could pack a lot of weight, had mostly wooden chairs at home and in the field preferred to sleep on the ground with a thin pad or none at all. I didn’t complain very often because it did no good. If I ever did grumble, Mom and Dad would sort of laugh it off. Nonetheless, don’t get the impression I would rather have stayed home. 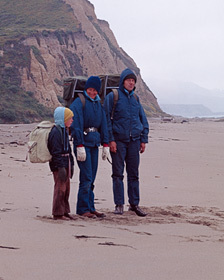 Not in a million years would I miss a backpack with my parents when they had arranged for me to be able to go along. Our backpacks are some of my fondest memories and most enjoyable experiences of my life, despite the heavy packs. I completely forgot about the pack weight, until I saw this photograph. In the old days we never had to carry water. We did carry iodine tablets but never used them. I remember distinctly at Point Reyes that there were lots of springs coming out of the cliffs and fresh water streams that we drank from. While at camp, Mom usually boiled the water we drank with meals and cooked with, but while on the trail during the day, we drank from natural sources, sometimes at most using a Sierra Club cup. Oh gee, I got on a roll talking about my parents and backpacks and forgot to ask you, Steve, where in the Mojave Desert you go, if it’s not a secret? We used to have certain backpacks that were secrets. I have always been interested in visiting the channel islands too. My favorite spot would be the Big Bend region. Favorite hike there could be any, really…. but for now I’ll say the chimney hike is my favorite. The chimneys are off the beaten path (even for Big Bend), and are a unique geological formation in the middle of the desert flats. American Indians have used the chimneys for, well, forever to get away from it all and think. As do I. Thank you, Derrick. I can’t wait to get back to look up the backpack I mentioned previously in Big Bend National Park that I went on with my parents. I remember it was high elevation and very cold for that time of year. Hi David. My favorite hike would have to be the Cataract Trail in Marin County. It isn’t a long hike but is rather strenuous since it is very steep and can be slippery in the winter. It is truly a magical place given how close it is to a major metro area. Hi Richard, Mount Tamalpais, or Mt. Tam as locals call it, was one of the places my dad first hiked back in the 1930s, one that he liked the most before he started backpacking in Yosemite at age 16 in 1938. I have yet to hike on Mt. Tam. I will have to try the Cateract Trail some time. I sure wish my parents took me backpacking but they did take me to a few national parks so I got to love them for that. Never the same place twice yet. I don’t do much broadcasting on the open net about most of the places I head off into out in the Mojave unless it’s Death Valley or one of the other well known places. Some of the places it just seems it would be difficult to explain where they are. The Channel is like desert backpacking because you have to carry all your water their too. Thank you, Steve. I understand not broadcasting on the internet your favorite backpacking places, particularly specific locations. You have provided just what I was curious about, a rough idea of the general areas you like to go. My dad was always against backcountry guidebooks and especially photographing guide books. He didn’t understand why people would want to ruin the joy of making their own discoveries on the land, or through buying their own topo maps and using local agency trail maps. He was not much for connect-the-dot camping. He advocated in-depth learning about a place. Hi Liz, thank you for your suggestion, quite exotic. I will have to look that up. Have never been to Thailand, but hear it is well worth visiting. Do you travel a lot? Have you backpacked in many other countries? What was the highlight of backpacking in Thailand? Thank you for another comment, Liz. Thailand is definitely on my list. I have heard it is a paradise.